What Make’s Nathan’s Pickles So Famous? When we heard the news that Nathan’s Famous Pickles has decided to give Canada a taste, we simply had to say; “why not eh?”. Truth be told, as Canadians we’ve never been opposed to finding that perfect crunch and aroma when it comes to the pickle that completes are own famous delis and sandwiches! In light of this, we wanted to know exactly why major food sources in Canada; such as Loblaws, No Frills and Fortinos, have hailed “open sesame” to filling their shelves with Nathan’s Famous Pickles. But to win us over, Nathan’s Famous Pickles were put to the ultimate test, up against all the five senses! What makes Nathan’s Famous pickles so great? 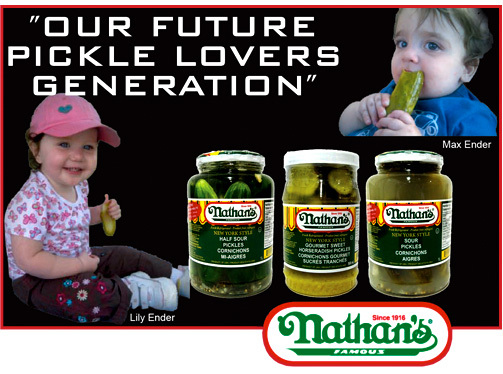 It looks like the pickle experts agree – Nathan’s Famous pickles are the great ones! The brine is light, the pickles are crisp, and the garlic and dill complete the tasty recipe. This is a mild and well-balanced pickle – the ideal snacking pickle! And according to pickle aficionados, the flavor is not over-whelming, giving the pickle a cool and refreshing tang. But the best news of all is that Nathan’s Famous pickles have finally arrived in Canada! NATHAN’S KOSHER WOW PICKLE IS NOW IN CANADA! CALLING ALL FOOD LOVERS – NATHAN’S KOSHER WOW PICKLE IS NOW IN CANADA! They will be available at all Loblaws, No Frills , Fortinos, and ValuMarts in the refrigerated meat coolers. Thank you LOBLAWS, NO FRILLS, FORTINOS, VALUMARTS! For your historical decision to support Nathan’s famous KOSHER NEW YORK BRAND of PICKLES in your stores. The famous NEW YORK Brand will WOW all the Canadian consumers and pickle lovers with it’s LOVE AT FIRST BITE FLAVOUR EXPERIENCE and they can be found in the refrigerated meat cooler sections. Foodfest is very excited about bringing Nathan's Famous Kosher Pickles to Canadian Supermarkets and making them available to pickle lovers in Canada. Be prepared to experience love at first bite!